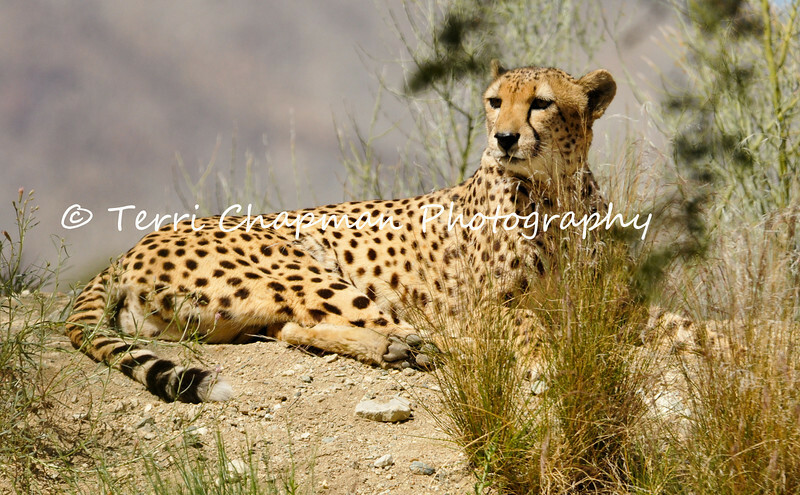 This image is of a female Cheetah relaxing. Unlike true big cats of subfamily Pantherinae, the cheetah can purr as it inhales, but cannot roar. By contrast, the big cats can roar but cannot purr, except while exhaling. The cheetah is still considered by some to be the smallest of the big cats. While it is often mistaken for the leopard, the cheetah does have distinguishing features, such as the aforementioned long "tear-streak" lines that run from the corners of its eyes to its mouth, and spots that are not "rosettes". The cheetah is a vulnerable species. Of all the big cats, it is the least able to adapt to new environments. Once widely hunted for its fur, the cheetah now suffers more from the loss of both habitat and prey. Cheetahs are included on the International Union for Conservation of Nature (IUCN) list of vulnerable species (African subspecies threatened, Asiatic subspecies in critical situation) as well as on the US Endangered Species Act: threatened species.